Drinking beer and raising money for animals – what could be better?! Join us for a fun-filled fall afternoon in Old City to raise money for Philly’s homeless animals on Saturday, October 13th. 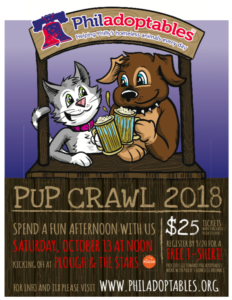 The Pup Crawl will kick off with check in at noon at The Plough & the Stars located on S 2nd Street. 100% of the funds we raise supports and funds much needed food supplies, medical supplies and upkeep for ACCT PHILLY – the Phila animal intake shelter as well as the rescues that pull homeless animals from there. Grab your friends and come spend the day supporting Philadoptables! Please drink responsibly. You MUST be 21 or older to purchase tickets.